DeepWood hosted ‘The Pig Who Went to Market’ dinner on Monday night. 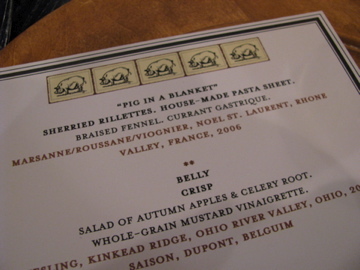 To be precise there were two prime Ohio hogs involved in the preparation of this 7 course porcine feast and DeepWood is a restaurant. But otherwise the name was fitting, this dinner was truly a celebration of all parts pig. A true snout to tail meal, it had been months in the planning and involved 5 chefs as well as beer and wine experts to select the pairings. I have been to several dinners that pair wines and beers with food, including one excellent one at DeepWood last year, but I have never been to a dinner that uses the same animal for such a succession of courses. The tone was set with a buffet selection of hors d’oeuvres which included head cheese, a chunky terrine and gougeres filled with pulled pork. An espresso cup of salty ham hock consomme whetted my appetite as well as my palate. The hors d’oeuvres were accompanied by a choice of drinks and while I did sample a little of the bacon infused bourbon manhattan, I plumped for the excellent (and pig themed) Charkoota Rye smoked doppelbock lager from Holland Michigan. We moved to the family style tables in the front section of the restaurant and had a chance to peruse the menu. In addition to the menu descriptions, each course and pairing was introduced by head chef Brian Pawlak and owner Amber Herron who along with Sous Chef Colin Vent and Beverage Director Catherine Morel had selected the pairings. 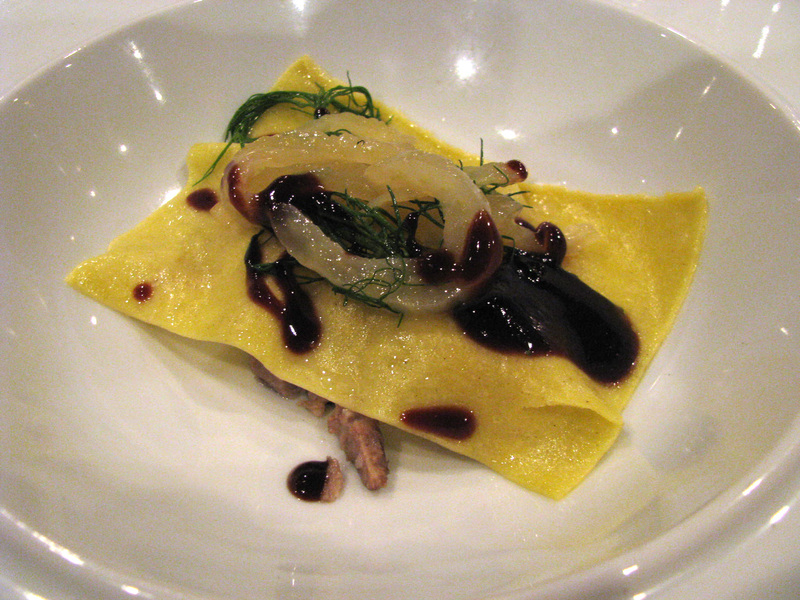 The first course was a ‘Pig in a Blanket’ with sherried rillettes covered with a house-made pasta sheet and topped with braised fennel and a pungent currant gastrique. The flavor of the fennel was a little lost against the gastrique but this was a sound dish. The wine pairing was a Noel St. Laurent, Rhone Valley Marsanne/Roussane/Viognier (2006) imported by United Estates. It was very smooth, well balanced and its mild acidity was a good foil to the dish. The next course was my favorite, a citrus glazed pork belly perfectly cooked and served on a bed of autumn apples and celery root salad with a subtle whole grain mustard vinaigrette. 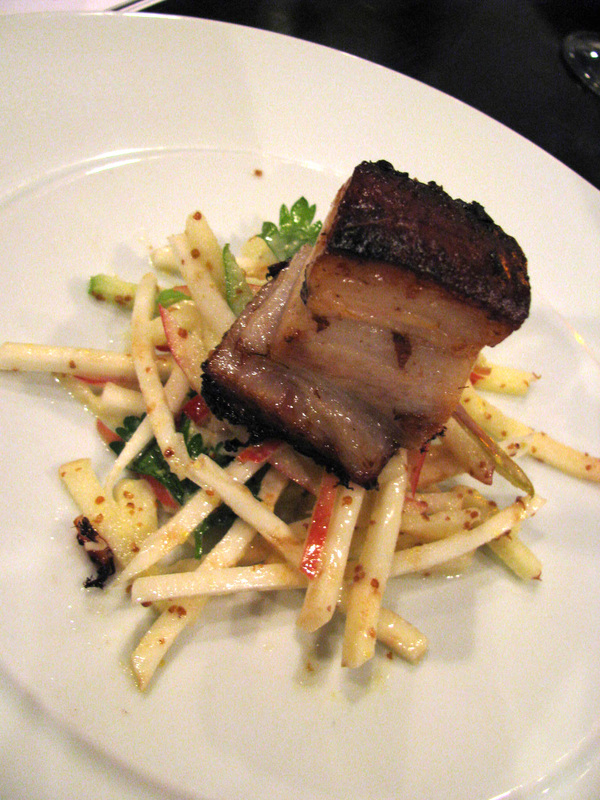 The pork belly was crisp on top with its layers of tender meat and succulent fat. The apples, a mix of Granny Smiths, Jonathan and Honey Crisp and the celery root were a well chosen accompaniment, refreshing, crunchy and clean tasting. 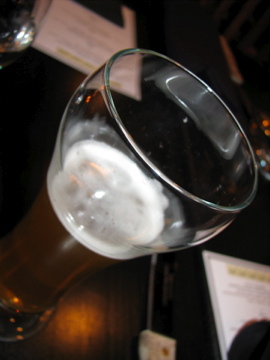 With this course there was both a wine pairing from my favorite Ohio Wine producer Kinkead Ridge (their 2008 Riesling) and a beer pairing – Saison, Dupont from Belgium. The belly was followed by the check (we were not eating in anatomical order) and this was pot roasted in white wine and served over cannellini beans with natural jus. This was paired with a sparkling Malbec rose which challenged my assumptions about sparkling roses (it was much less sweet than I expected) but in my opinion did little to complement the food. The next dish was a winner. 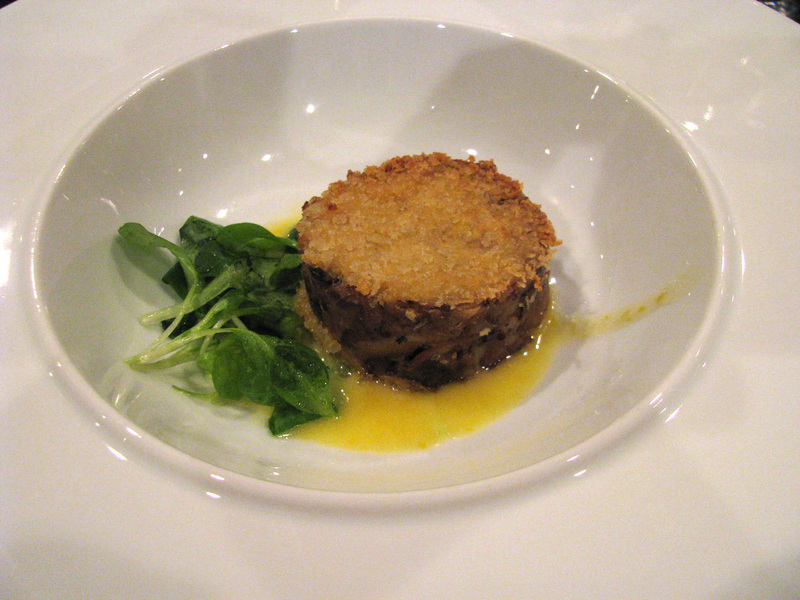 The ‘trotter’ course was described simply as a cake and was therefore the subject of much speculation during the meal. In reality it was mostly shank, seasoned with mustard, moulded, topped with panko and grilled. It was served with a citrusy hollandaise sauce that reminded me of lemon curd (but less sweet) and mache. The sauce did not win universal approval but the trotter cake (for the less squeamish at the table) was truly a treat. 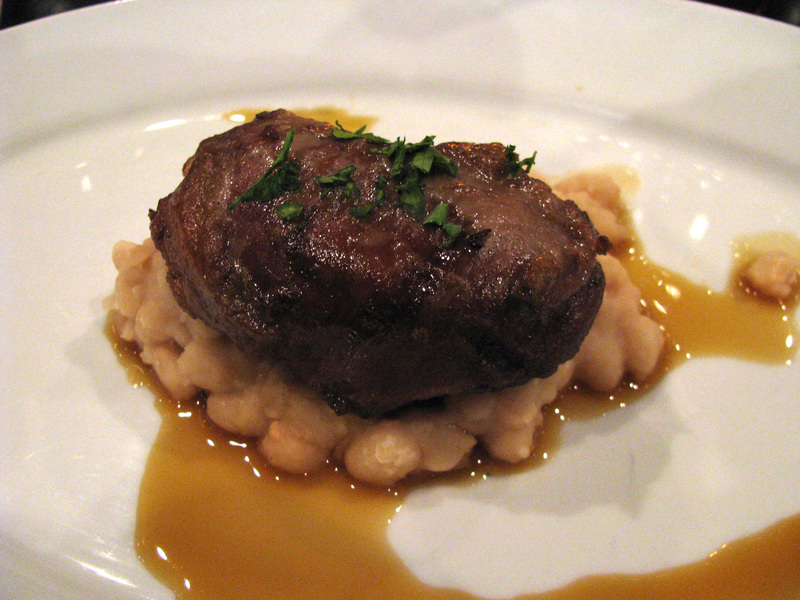 The penultimate course was tenderloin stuffed with port-braised-shoulder and wrapped in house-made pancetta. 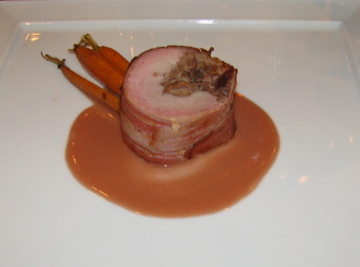 It was served with beurre rouge and roasted baby carrots. The pancetta was very thinly sliced, salty and crispy. The tenderloin could have been a little moister but the stuffing was very good. This was a great pairing too with a Portuguese Duoro wine – Apegadas (2005) – made from port grapes and the first release from the winery. Actually it was another double pairing and was also served with the robust Rogue’s Imperial Stout. Stuffed though I was, I was still powerless to resist the lure of bacon. Dessert was a banana-bacon-pecan-strudel with a caramel sauce, paired with a Triple Imperiale Belgian beer. Caramel and banana is a classic combination but the crunchy bacon and light flaky pastry raised it to another level. It was a fitting end to a gluttonous meal. I have said before that DeepWood is often overlooked in Columbus’s culinary scene. 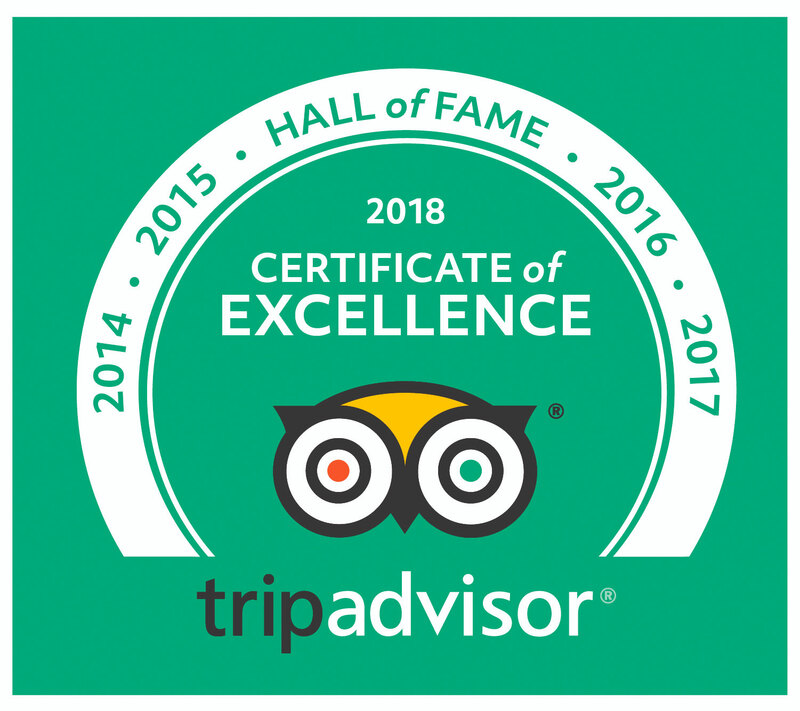 Tomorrow is a great opportunity to try it, with a $25 3 course special for the gallery hop. oh my f’ing god! How did I miss this. I want some pork belly…now. Here’s one for you: healthy, fast, delish.